In the north, the majority of the west coast is only accessed from rough gravel logging roads - but the journey is well worth the effort. The mix of rocky outcrops, sandy or pebble beaches awaits the adventurous and at Raft Cove Provincial Park there is a little bit of everything. At low tide, tide pools which have formed in the depressions of the rocks harbour a mosaic of marine animals such as sea anemones, crabs, mussels, and star fish etc. 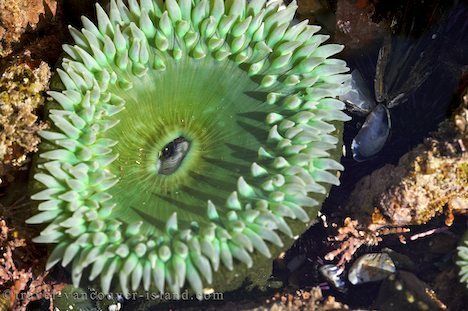 Of particular abundance are the sea anemone which, although pretty to look at, are carnivorous animals which prey on fish, zooplankton, and mussels- just to name a few. Sea Anemone, San Josef Bay, Northern Vancouver Island, British Columbia, Canada. Picture of a sea anemone attached firmly to a rocky outcrop at Raft Cove Provincial Park.